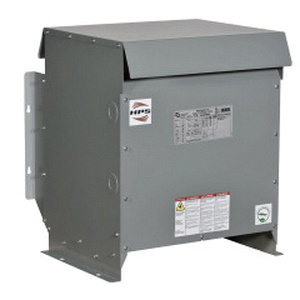 Hammond Manufacturing HPS Sentinel G® 3-Phase energy efficient general purpose distribution transformer has a power rating of 150 kVA, primary voltage rating of 480-Volts Delta and secondary voltage rating of 208Y/120-Volts. The floor mount transformer has aluminum windings to eliminate the power loss. The transformer in ANSI 61 gray color, is NEMA 3R rated. The transformer meets UL E112313, CSA LR390R and NEMA ST-20 standards.